This week's lesson was based on the Gospel Principles manual chapter 16, the Church of Jesus Christ in Former Times. This was a harder lesson to try and teach to a toddler, but I think it went over fairly well. Organization isn't the most exciting topic for young kids, so I tried to make it fun. teachers, evangelists, and so forth. Lesson: Jesus established His church while He was on the earth and it was called the Church of Christ (3 Nephi 27:8) with the members being called Saints (Ephesians 2:19-20). Jesus taught His followers that revelation was the rock upon which He would build His Church (Matthew 16:16-18). Even after His ascent into heaven after the Resurrection, Christ was with His people (Matthew 28:20). He sent the Holy Ghost (John 14:26), He spoke in visions (Acts 9:3-6), and revealed many things to His apostles (Acts 10). The Father gave Jesus Christ the priesthood authority (Hebrews 5:4-6), who in turn ordained His Apostles and gave them priesthood power and authority (Luke 9:1-2). The ordinances and principles of the gospel cannot be administered and taught without the priesthood. The Church of Christ was a carefully organized unit with Christ as the chief cornerstone (Ephesians 2:20). Jesus appointed priesthood leaders as Apostles and Seventies along with many other officers in the Church. The Apostles taught two basic principles: faith in Jesus Christ as Lord and Savior, and repentance. After new converts had faith in Christ as the Son of God and had repented of their sins, they received two ordinances: baptism by immersion and the laying on of hands for the gift of the Holy Ghost (Acts 19:1-6). Jesus provided for everyone to hear the gospel, whether here on earth or after death. After His death He organized missionary work among those who were dead to give them an opportunity to accept His gospel (1 Peter 3:18-20; D&C 138). Living members of His Church then performed ordinances in behalf of the death as baptism and confirmation must be done on earth (1 Corinthians 15:29). All faithful members of the Church were entitled to receive gifts of the Spirit according to their individual needs, capacities, and assignments. Some of these were faith, power to heal, power to be healed, tongues, interpretation of tongues, prophecy, and visions. After Christ was resurrected, He visited the people in the Americas and organized His Church among them (3 Nephi 11-28). Throughout history, evil people have tried to destroy the work of the Lord. They openly rebelled against the Church, persecuted the believers, and killed the Apostles. After the Apostles were killed, the line of authority was taken from the earth. With the true Church no longer on the earth, we entered the period of the Great Apostasy. God had foreseen the Apostasy and prepared for the gospel to be restored (Acts 3:20-21). Activity: I saw the missionaries teach a similar lesson to this one using Jenga blocks labeled with the different aspects of Christ's church. Unfortunately, the entire city seemed to be completely sold out of Jenga blocks, and of just blocks in general. Instead, I just printed out colored rectangles with the same labels and had June build a 2D church using each of the "blocks" as we learned about them. When we discussed the Apostasy, I took some of the blocks away (temple ordinances, ordinances for the dead, prophet, apostles, priesthood) and I gave June three separate stacks of the "blocks". She then built three churches using the pieces given. I explained how after Christ's Church was taken from the earth, other churches were build. They each had some truth, but they didn't have the complete truth, which is why so many churches teach so many different things. 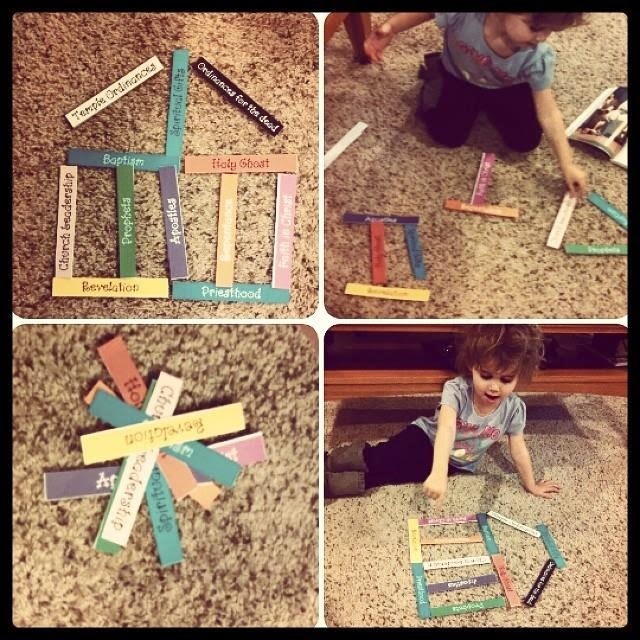 She liked building the Church from the paper strips, but I think she would've enjoyed building with the blocks instead. Still, the activity went over pretty well. I am very thankful that there are posts on the FHE lessons. They are wonderful to resort to when I need help with ideas. I'm happy to hear they're helpful!